The Cleveland Browns‘ controversial move of hiring Kareem Hunt before the NFL’s investigation into the running back shoving and kicking a woman during an altercation last year concludes brings with it more questions than answers. One of those lingering football-related queries is what the addition to the backfield means for the other players currently on the roster. Nick Chubb obviously earned the lead-role duties with his brilliant play down the stretch last season. Hunt could cut into that workload but likely shouldn’t siphon off too much of the ground action. Where the addition could alter roles is in the passing game, with Hunt potentially supplanting pass-catching back Duke Johnson. 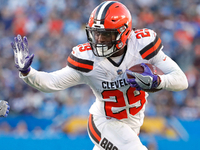 At this point, Browns general manager John Dorsey isn’t indicating he’s moving on from the chess-piece running back he gave a new three-year contract extension to last offseason. With Hunt expected to be suspended at least a good chunk of the season, the signing shouldn’t shuffle the Browns‘ backfield much out of the gate, keeping Johnson in his role. Once the suspension ends, then the Cleveland coaching staff can figure out how to maximize their talent.